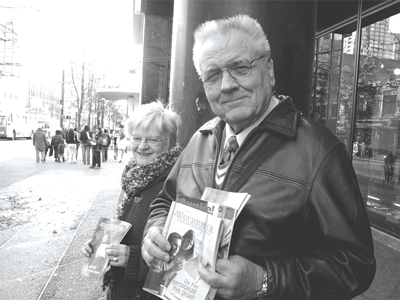 John and his wife Betty are Jehovahâ€™s Witnesses. Heâ€™s in his sixties, and sheâ€™s in her fifties. Only: What is going on right now that Jehovahâ€™s witnesses are concerned with? John: According to The Bibleâ€™s prophecies we are, right now, living in what probably could be termed the last days of the last days â€¦ We donâ€™t know the day or the hour, but we know the season. Jesus said that we would know the season. O: What is the season? J: The last days. We are close to the end of the last days. Which is actually good news. O: Really? Sounds pretty scary to me. J: Well a lot of people have reason to fear the last days. But for those that are on Godâ€™s side, it actually means the beginning of a whole new system of things. And so, for those who are on Jehovahâ€™s side, the end of days means that weâ€™re very soon going to be back in that paradise situation. O: That is exciting. But what happens to the rest of us? Iâ€™d say Iâ€™m not on his side. J: This is what this work is all about. A kingdom is a form of government, and itâ€™s Jehovahâ€™s government, this kingdom that is going to re-establish that paradise. Itâ€™s already at work right now on the earth. We have an organization today that is unique among all organizations â€“ there are about six million proclaimers of that kingdom in the world right now in 210 different lands. We are an organization united in a brotherhood. We donâ€™t vote or join armies. J: No Jehovahâ€™s Witness will ever vote. We are neutral. We already are subjects of a government. J: Thatâ€™s right. And so we are ambassadors for that government. Just the same way an ambassador from England wouldnâ€™t vote in our affairs here. J: Weâ€™re citizens of every country in the world.